National Geographic Children's Books, 9781426331404, 112pp. 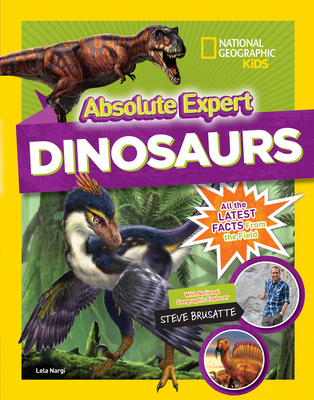 Tear through tons of facts, figures, timelines, and the most up-to-date intel straight from the field, with National Geographic explorer and paleontologist Steve Brusatte as your expert guide, in this cool book all about dinosaurs. Have you met Pinocchio rex? Meet this fascinating dino along with favorites, such as Tyrannosaurus, Stegosaurus, Triceratops, Velociraptor, Apatosaurus, Ankylosaurus, and Giganotosaurus. Plus, check out some weird or newly discovered dinos you may not know about. See how fossils are formed. Learn about the epic, earth-shaking extinctions that paved the way for life today. Find out whether dinosaurs really had feathers, and so much more! All this, along with special features, awesome illustrations, sidebars, wacky trivia, and facts from experts in the field, make this the ultimate book to help YOU become an absolute expert on one of your favorite subjects. LELA NARGI writes about science for kids for publications like Muse, Science News for Students, and Highlights. She's also the author of The Honeybee Man, a picture book about an urban beekeeper that takes place in her home borough of Brooklyn, New York and Above and Beyond, a middle grade companion book to the exhibit of the same name that originated at the Smithsonian National Air and Space Museum, about the history and future of flight. Nargi is an avid fossil hunter who has found hundreds of fossilized shark teeth in Florida, insect and plant fossils high up in the Himalaya, and tiny fossilized shells in the middle of the Thar Desert in India. But she hasn't found any dinosaur fossils...yet! Contributor and dino expert DR. STEVE BRUSATTE is a paleontologist at the University of Edinburgh in Scotland. He studies dinosaurs and other fossil animals. and is particularly interested in the origin and evolution of dinosaurs. He has named more than 15 new species including, Qianzhousaurus (Pinocchio rex), Zhenyuanlong, Timurlengia, and Balaur. He has done fieldwork around the world and often appears on television and radio.